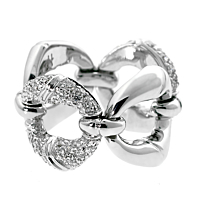 Brilliant white gold and radiant diamonds make up this timeless bamboo ring. The diamonds are clustered in an almost circular form for radiance while the white gold setting adds even more gleam to the adornment. With this bamboo ring on your finger, you'll have the chance to show the world the bright side of your personality.